One of the motivation for me to learn programming is to create my own game. 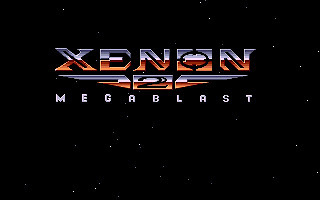 And the game that propel my interest in programming most is Xenon 2. 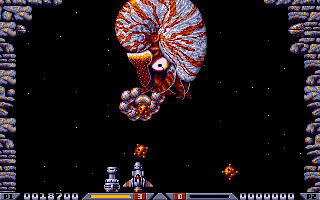 The first time I play Xenon 2, I was totally blown away by its 256-color VGA graphics. It was the first time that I see game with VGA graphics! The starting screen itself is amazing enough. The starfield effect alone, I've spent quite some time to simulate it. Also about the soundtrack, with PC beeper only, the programmer manage to produce some drum and bass effect. 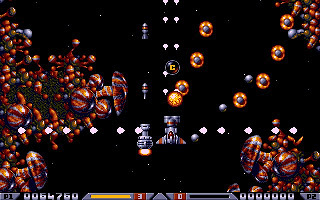 The gameplay of Xenon 2 is simple, just shoot-them-up. After we kill the bad guys, we will obtain money in the form of little bubble. There are also upgrades that fly from the side of the screen on some occasions. During middle and end of a level, we will enter the shop like above. We buy weopon upgrades to equip our ship better for the coming level. When we upgrade enough, usually in level 4, we can achieve the maximum firepower like above. The thing that I like Xenon 2 is, if we die in the middle of the game, we won't loss our weopon upgrades! And when we reach maximum firepower, it basically cover the whole screen. At middle and end of a level, we will meet bosses. And wow, some bosses are hard to defeat though. 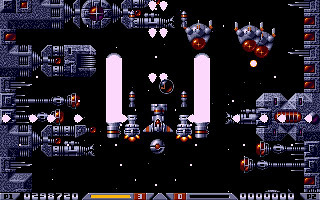 Xenon 2 was published around 1990. And at that time, it is nearly impossible to see a fast action shoot-them-up in PC. 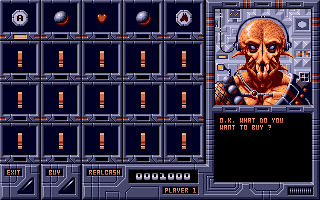 I always wonder how the Xenon 2's programmer can produce such great game with limited computing power at that time, and it is this curiosity that drive me to improve my programming skill after that. You can get your copy of Xenon 2 at here. To play the game, you have to install DosBox first. You can get DosBox for free at here.